Poster for Before I Go to Sleep starring Nicole Kidman asks WHO DO YOU TRUST? A new poster for Before I Go To Sleep is now online. The red palette is in stark contrast to the cool blue poster we saw previously and asks the question WHO DO YOU TRUST? The answer lies in that prior poster: DON'T. TRUST. ANYONE. I'm excited about this one and while I had a few quibbles with S.J. Watson's novel, like Dennis Lehane, I found it to be an exceptional thriller. The movie comes out October 31st here in the states - a legitimate excuse to skip handing out the Halloween treats? Many of you in other places around the world will see it long before I will - you Kiwis and Kuwaitis get it on September 4th, it opens in the UK and Ireland on the 5th, followed by Taiwan, South Africa and Poland on the 12th. Check out this link to see when it opens in a theatre near you. Aussie pals, you're getting it a couple of earlier than us, on October 16th. 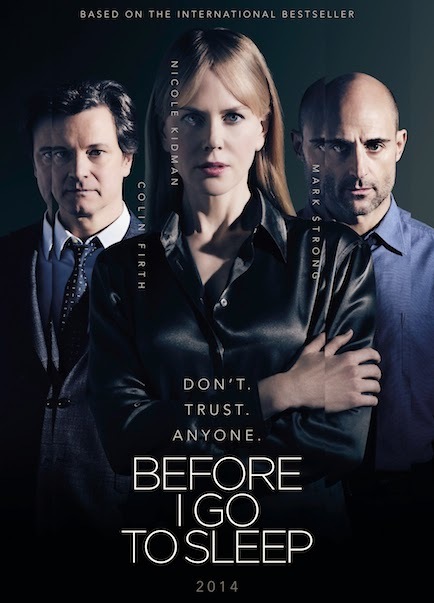 Before I Go To Sleep stars Nicole Kidman, Colin Firth and Mark Strong and is directed by the acclaimed theatre director Rowan Jaffe. Let's watch the trailer.